I am leaving this week for a trip to Nicaragua, to visit a dear friend who has been serving as a missionary there. I’ve got my passport. My bags are packed. (Well, no. That’s not true. But I do have a list in my head of what to take.) I’ve read the guidebooks and called the credit card company so my card won’t get canceled. I’m ready. Except for the little detail of saying goodbye to my kids. I almost talked myself out of going on this trip, thinking about leaving them behind. It’s by no means the first time I’ve left. My husband and I both travel a fair bit, and everybody gets along fine. I miss them when I’m gone, but it’s okay. But this will be the longest I’ve been away since my oldest was a toddler, and it’s definitely the first time I’ve left the country since before I was a mom. I’m a worrier by nature. I generally fret over the inconsequential things – what shoes should I pack? – and not the big scary what-ifs, but there’s always that little nagging voice in the back of my mind that tries to make me worry about the bigger things. Something might happen to one of them, and I wouldn’t be able to get back fast enough. The plane might crash into the ocean. I might get malaria or typhoid fever. I might lose my passport and have to live in Central America for the rest of my life. While I’m gone, they might decide that they really don’t need me anymore. They might miss me. When my daughter – now six – had just turned three, she and I went on a girls-only trip to visit my sister in Boston. It wasn’t her first airplane ride (she’s been flying since she was five weeks old; when you live far away from your family, you spend a lot of time on planes and get very efficient at airport security lines), but it was the first time she didn’t need a stroller, the first time she was really old enough to pay attention. I helped her pack her ladybug suitcase, and made sure Elephant was tucked in the outside pocket, secure but available for easy access. We packed toys and books for the plane, and planned what we’d ask for when the beverage cart came by (apple juice for her, and cookies, if there were any available). We drove to the airport and found a spot in the parking deck – she was full of questions about how everything worked – and then made our way to the shuttle. 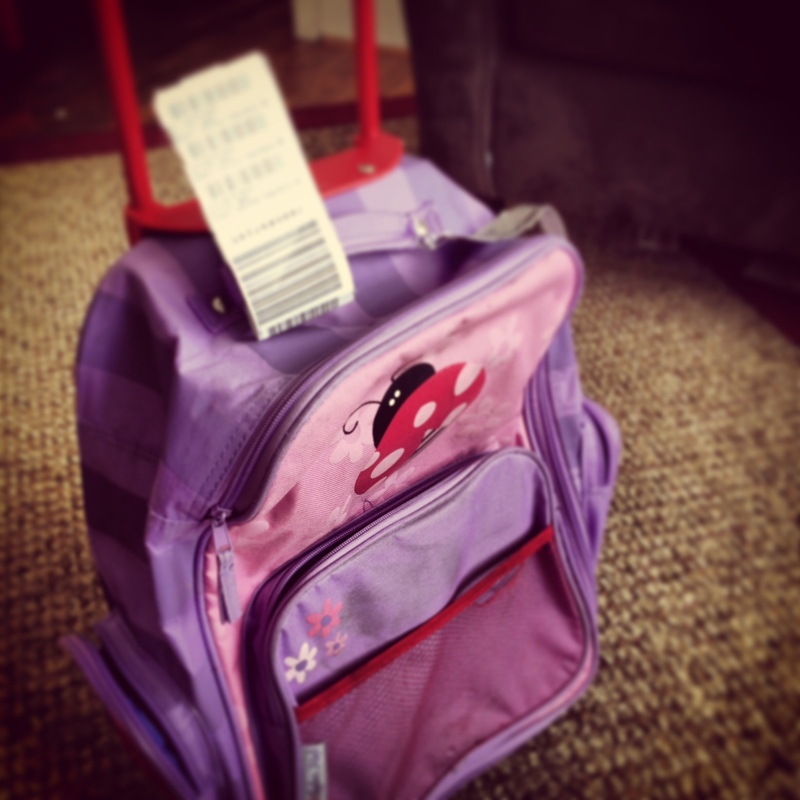 I remember so distinctly the tilt of her head as she walked ahead of me, pulling the ladybug suitcase behind her. Strong and confident, off on a grand adventure to see the world. That’s why I’m traveling this week. God made a big, beautiful, complicated world out there, and I think we should see as much of it as we can. When a grand adventure presents itself, we ought to pack our bags and go. I want my daughter to embrace opportunities as enthusiastically and as confidently as she did that trip to Boston. I want her to savor such experiences and live life to its fullest, even when stepping out into the world feels a little scary. As for my trip, I won’t know until I get there if I packed the right shoes. I’ll keep close track of my passport, and I’ll try not to worry too much about the big stuff because I can’t do anything about it anyway. I will miss them, and I’m pretty sure they’ll miss me. But I think we’ll all survive until the next adventure, and then maybe we’ll go together. Tags: children, family, kids, parenting, traveling. Bookmark the permalink.